I'd say it all started about a year ago. I was newly into Elimination Communication to go along with my new baby. Somehow I stumbled upon Hobo Mama's blog. I don't recall what search I did or what link I followed, but I immediately appreciated her honesty and writing style. I half-jokingly volunteered to be a guest blogger (she was requesting volunteers!) on Hobo Mama's blog, thinking I surely didn't have enough experience or something. She gladly accepted my offer and I was SO excited and flattered! Hobo Mama teamed up with Code Name: Mama to create the Carnival of Natural Parenting. Mind you, I don't think I had ever heard of this kind of "Carnival," though I recall when Web Rings were big. As I read Hobo Mama's Carnival posts, I also followed links to read (and comment!) on others. I also enjoyed her Wordless Wednesday posts and the links to others. I toyed with the idea of participating in a Carnival of Natural Parenting. Finally, I did it. I signed up. Mind you, I wrote the piece (in one sitting!) and then submitted the form. After all, I didn't want to volunteer without knowing I could put out the material! I have now participated in the last two carnivals. I post WW weekly and am starting to put together a weekly Sunday Surf. In the back of my mind, I hope Hobo Mama isn't creeped out thinking I'm stalking her. She simply inspires me! 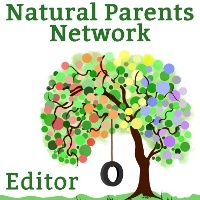 Hobo Mama and Code Name: Mama had another joint venture: The Natural Parents Network. I have been trying to volunteer, but haven't really had the time to commit to a project for them, though my nursing "better than candy" pic was featured on their first WW post! Meanwhile, it seemed I kept stumbling onto blog entries and links about unschooling. I was doing some real soul searching about my current career path and the minimal time I am getting to spend with my family. I had all but decided to unschool, but didn't feel it was an option for us with me working FT outside the home. While reading on The NPN one night, I followed a link to someone's blog. As I said in my recent Educating Our Children - Huge Decision post, I came upon an article: It was 5 Things Your Unschooler Needs to Know on Enjoy Life Unschooling. This article was my final straw for this topic. I knew I needed to find another way to support my family, a way to do it from home, so I could unschool. It was time to stop accepting and assuming that I had no other option than that hell hole that steals me away from my family for 40 hours every week. I dove into researching my options. I have worked from home before (for 8 years), I was sure I could do it again now! Then, in a recent Sunday Surf, Hobo Mama linked The Organic Sister's blog entry on Unjobbing. Wow. Very much like the Unschooling article had been a wake up call, so was this article. I had never even heard of Unjobbing, but it made sense! I linked both of these last articles in my Sunday Surf: First Edition. I think this makes the third time I've mentioned at least one of them. Since then, I've contacted The Organic Sister, followed links to more blogs, and done research on how to do what she and her family do: unjob and unschool, from their adventure on the road! I have always envied people that were brave enough to pick up stakes and move to a new town. I've been jealous of people that make the time and save the money to travel. I want to see the country, too, and maybe even the world! I read the entire page. It was a long ad! But I was... inspired. I'm trying to trim my spending, but something told me that this eBook was worth the cost. I hoped I was right! On a whim, I bought the book last night. I immediately began to devour it! I stayed up and read 2/3rds of it last night. I had to tear myself away to get some sleep, since today was my early day at work! I finished the eBook in no time! This book has some amazing resources for making my dreams come true! I was right on that gamble, it was worth every penny! I am on the right path and now have more resources at my disposal. I've set myself a sort of deadline, though we've got to work out another pregnancy with that plan, too. Today I've added pictures of places I'd like to take my family: Oregon, Florida, and the Grand Canyon for starters! My current plan is to hit the road by next Fall. However, we have planned for me to be quite pregnant at that time. We have more research, saving, and decluttering to do! I've already started getting rid of things! Hopefully I'll have even more fans in the next couple of years and can start visiting YOU, too! Just found you from Tara's. I hope to meet you on the road as well. we are fellow traveler (hence the blog name) I have always wanted to start a blog and I always thought I didn't have anything to write about but it just comes to you. Sometimes, I am at a loss of what to write but I get inspiration from so many different places online. Blessings to you!